It's time for everybody's favorite game show Spot the Sig! The picture has been blown up to double size so don't let that confuse you. And as usual there is bonus trivia this week - To get the bonus you must name a player who played the same position as this weeks Spot the Sig! subject on the Phungo Fantasy Baseball squad this past season. Ground Rule for the bonus is that each person is only allowed one guess, but we can have multiple winners as my team had more than one player at the position. Some hints on the bonus - it is a 10 team keeper league so the draft runs deep and we play National League only. Bonus is good for a stolen base if you have men on or a walk if you have the bases empty. Spot the Sig! (STS) is a pretty simple concept - guess who's signature is presented each Sunday, score runs, and win cards. If you would like more background on STS or to check out the ground rules click here. I know I am way behind with this one - It sort of got lost in the Phillies stretch run. So yes, I opened this box a while ago and just wanted to go over the stats just in case anyone out there is still working on 08 UD Goudey. I don't remember the configuration 8 packs of 8 it looks like. 53 Base - Five of which were duplicates of 4 hobby packs that I had bought previosly - that seems a little high. 1 Phil, Hamels, which I needed. 7 of the base were retired stars. 1 President #250 James Buchanan - The only president from Pennsylvania. 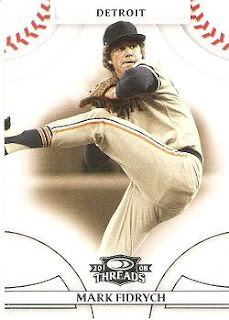 08 Goudey fell in the like but not love category for me, I had opened a couple of hobby packs over the summer and generally liked the product enough and that convinced me to get a blaster to gather some additional base cards. The only disappointment was that 5 of the cards from the blaster I already had in a pretty small collection of maybe 25 cards from 4 hobby packs. Otherwise I was pretty happy, the inserts in this blaster were all decent, Jason Bay isn't the flashiest card in the Materials set, but he is a player I root for so thats definitely a nice addition to the personal collection. Paul's Random Stuff initially reported on the plight of Ricky Stone and his family last week. I think the story is worth repeating here. Stone has recently been diagnosed with a malignant brain tumor. Ballplayer's on the fringes of the major leagues can have nomadic periods and unfortunately this was the case for the Stone family (Wife Tracey and two children) at the time of his diagnosis. Tracey was scheduled to take on a teaching position, however, the family was temporarily without insurance. To defray some of the medical costs of Rickey Stone's recovery, Alisa and Nelson Figueroa (former Phillie, more recently a Met) have organized an online benefit auction. The auction runs through Sunday on ebay. There are some really nice game worn items and lots of autographed baseballs donated by Major League Baseball Players and the Players association. The items also represent many different teams across the league. Hopefully the benefit goes well and the Stone's can eventually resume a more normal life. I would also like to mention that near as I can tell ESPN has given this story NO coverage. Go ahead google "ESPN Ricky Stone Tumor". Lots of stories (and a handful from blogs) , yet not one regarding the current state of Ricky Stone's health can be attributed to ESPN. Meanwhile the off-the-field stories of Lawrence Tynes and Jimmy Connors ran across the bottom line ad nauseam during the last few days. I am not disputing that either of those stories is of some import, I only believe that the Stone story is deserving of it's own attention from a corporation that considers itself a major outlet of sports news and information. In short it bewilders me that the best place for me to get this information is from fellow bloggers who have a common interest in baseball cards and memorabilia. This week we take a break from all of the Philadelphia Sports Hall of Fame posts and honor Hall of Fame Quarterback Roger Staubach. In addition to all of the Turkey and harvest related traditions that surround Thanksgiving, a full and now fuller day of football has also become part of the tradition. 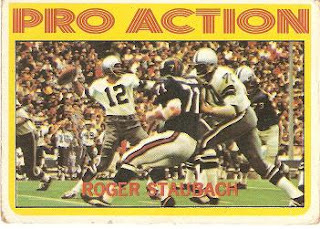 Much to my dismay the player that we watched each Thanksgiving during my formative years was Roger Staubach. He was nicknamed "Roger the Dodger" for impressive scrambling ability. Staubach, because of his Navy commitment, did not become a starting QB until he was 29. Yet there was still time enough in his NFL career for him to lead the Cowboys to two Superbowl wins and toss 153 touchdown passes. Staubach was inducted into the Pro Football Hall of Fame in 1985. As a Minnesota Vikings fans I have harbored much dislike for the Cowboys since 1975 when Staubach launched a TD pass to Drew Pearson that ended the Vikings season in the divisional playoffs. In researching this article I found out that according to wikipedia that TD pass is the first use of the phrase "Hail Mary" to describe a desperation throw at the end of a game. I found this hard to believe as I always assumed this usage of the term had been in the language since long before I was born. I still carry a loathing for the Cowboys....one convenience of Terrell Owens joining the team is that I can root against both T.O. and the Cowboys at the same time, which I plan on doing this Thanksgiving day. I have to confess, this weeks STS was a bit loaded. I put it up and pretty much expected Dayf to get it. In the spirit of Thanksgiving I wanted to send out a Thanks to Dayf who back in July added Phungo to his blog roll and for the first time I was getting outside readers. It may only be a couple readers a day, but it is always appreciated. So Dayf, thank you, and congratulations, and for correctly guessing the sig the Cardboard Junkie team hits a laser down the right field line good for a triple. Now on to the autograph. In September of 2005 Jeff Francoeur was a highly touted prospect in his rookie year for the Atlanta Braves. I was shocked when Francouer came over to sign for a small group of autograph seekers prior to the game. As I remember he was pretty affable and made small talk with fans while signing programs, cards, and balls for maybe two dozen people. Francouer’s Spot The Sig! auto is somewhat similar to his facsimile signature, at least the first name is. After what I think is the end of the Fs in JEFF he sort of scribbled through his last name. On his card you can see he basically prints the F in his last name – there is definitely no sign of that on the ticket he signed for me. The closest guesses for section and seat number were both by Dayf with 113 and 8 respectively. Night Owl came up with 14 for the closest row number. Each team will be awarded stolen bases and walks accordingly. 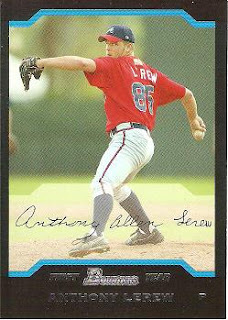 The odd thing is the real reason I was near the Braves dugout that day was to get an autograph from much lesser Braves Prospect, Anthony Lerew. Lerew had recently made his major league debut. This made him the first person from the small Central PA high school I attended to make it into the Majors or play any professional sport. Anthony Lerew’s career is yet to take off. He was a top 10 prospect for Atlanta back 04 or 05 but has not had any real success at the Major league level. He had Tommy John Surgery in 2007 and put up unspectacular numbers for a couple of Braves affiliates this past season while recovering. Anthony Lerew is currently on the Braves 40 man roster – I hope he gets another crack at the majors. Okay back to the STS standings. Currently we have completed 2 rounds and Cardboard Junkie is on the scoreboard! Following the triple they got two bonus questions - the runner on 3rd scores on a wild pitch for the first answer and a walk is awarded for the 2nd answer. The Night Owl team also gets their first runner on via a walk for getting a bonus question. Cardboard Junkie representing the Braves has a Run across and a Chipper on first. Stats on the Back and the Stinkin Mets and a man on second. Cardboard Addiction and the Fenway Faithful has a man on first. Night Owl Cards representing the Dodgers has young phenom Matt Kemp on first. If you want to get involved in the Spot the Sig! game click here for background on the contest and some ground rules. The next sig will likely go up Sunday night. I see a trip to card show on Sunday but will try and get a posting up around 10pm. I need to hear people's opinions on this Miguel Cairo card. 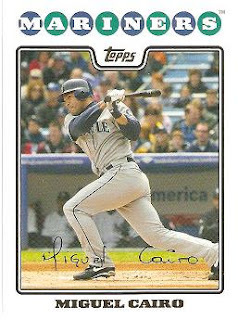 Can anyone let me know if you think that this card has been photoshopped (from Cairo's days w/ the Yankees possibly) or if this is really Cairo playing for the Mariners. Big Thanks from Team Phungo. This weeks Spot the Sig! was solved by Cardboard Junkie Dayf but there is still time to get in on the action and answer the bonus question. The bonus this week is total guesswork so anyone could possibly win - just go here and pick the section, row, and seat from the game ticket that is shown and you could be on the scoreboard in the Phungo Spot the Sig! contest. I will take guesses till 10:30p (Eastern) on Tuesday. This weeks Spot The Sig! is a ticket autograph. This appears to be one of the tougher autos in the Phungo collection and is worth a Triple to the first person to identify the Auto in the comments section of this post. If you are new to Spot The Sig! (STS) you can get some information and read the ground rules here. Basically each week the presented auto will be worth a baseball hit (Single Double Triple or Homer). Results are cumulative over several weeks and whoever scores the most runs via identifying the autos wins a stack of cards. This is the second week of the contest which I intend to run for about 15 weeks – basically the duration of the Baseball off-season. Recapping last weeks results - Mark from Stats on the Back guessed the Auto correctly for a double and Joe from Cardboard Addiction got the bonus question for a walk so the Spot The Sig Game status appears as Follows. It’s never too late to join the competition so leave a guess in the comments and maybe you will end up with some cards just in time for spring training. Oh yeah I almost forgot the bonus question. As you may have noticed the Section, Row and Seat number have been painted over on the ticket - To get the bonus guess what the section, row, and seat number are for this ticket. The closest answer for each number gets the bonus. That’s right this week there are really 3 bonus questions. One person could get the entire bonus or more likely it will be split amongst three readers. The bonus is a stolen base if you have a man on base, or a walk if you have bases empty. This week Mike Mussina formally announced his retirement from Major League Baseball. The fact that Oriole's Card "O" the Day, 30-Year Old Cardboard, Dinged Corners, and Fielder's Choice have all written about his retirement tells us a lot about Mussina's impact. I have always been a fan of his for several reasons. During the mid 90s he was a key cog in the Orioles staff and since then he has been the steadiest pitcher on the Yankees staff. His 270 wins rank behind only Maddux, Glavine, Clemens, and Randy Johnson among pitchers from his era. He has finished top 10 in his league in wins 9 times, top 10 in ERA 11. Despite never winning a World Series ring he did pitch fairly well in the post season. He played for nine different playoff teams. One of Curt Schilling's (11-2) two losses is against Mussina. Same for Josh Beckett (7-2 in the playoffs). And Mussina left the critical fifth game of the 2004 ALCS with a lead, in the 7th inning against Pedro Martinez, before Mariano Rivera blew the save. Beyond the post season he provided plenty of other great moments. I can still remember watching his near perfect game on Sunday Night Baseball in September of 2001. And this year he started and won the last game I will ever see at Yankee Stadium. Yes he may be Mr Almost. But he was not just pretty good. He was really really good. 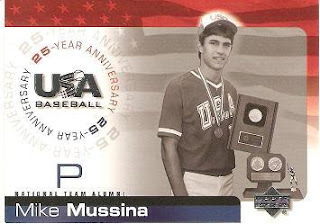 I would like to close by mentioning that Mike Mussina is considered by many accounts to be a real decent guy off the field. Each winter he returns to his roots in rural Central Pennsylvania to help out in his community. Sports needs more stories like this and we need to remember and honor those stories. I would like to also remind everyone that Sunday is Spot The Sig! Night. I expect to post the next Sig around 10:30 tonight. Stop back then and see if you can guess the Auto! I find my collection to be quite varied. I am a Phillies fans and would consider myself primarily a team collector, but I am also presently trying to build some sets, collect autograph cards, and star cards. These are all among things that other hobbyists collect. One thing that I collect which I have yet to see anyone else write about is cards representing games that I have attended. Perhaps this is because it is somewhat narcissistic. Yes I am geeky enough that I have created a file of Retrosheet/Baseball-Reference Box Scores of every game I have ever been to - all 201 of them. I collect cards that feature any of those games – sometimes I call them Phungo Games as in “Cole Hamels had the most Wins in Phungo Games this year” The only time I have even seen anyone mention anything similar is someone on the Bench was building a set of Yankee Stadium Legacy cards from the games he saw there with his father. So yes some mirror sets that many other collectors loathe, I actually have a use for. 2007 Topps Generation Now has a whole bunch of Ryan Howard cards representing HRs I saw him hit – I have a couple of these and some still on my want list. There is some true work that goes into Identifying these cards. One might ask how the heck are you sure that the Hamels card is from that specific game. Well here goes: The card is a home day game. That much I can identify from just looking at the card. 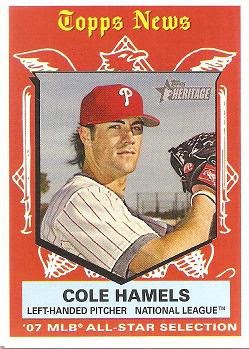 Cole Hamels did not reach the majors till 2006 so this has to be from an 06 game since it's an 07 series 1 card. Then I look at the scoreboard – The Orioles were at the Angels (They did not play the Dodgers in 06) The only day game which Cole pitched while the O’s were visitng he Angels prior to 2007 was on September 4, 2006. 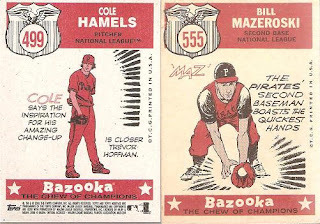 There are also cards of events I have seen that are related to players that are not Phillies. The scan is a little hard to read but the Gonzo cartoon mentions that he hit his 300th homer on June 5 2006. I collect these also – You put them next to the ticket and you have a pretty cool little item. Topps got the date incorrect on the card, but I still think it's a cool card. Oh and yes prior to this year I was at one game at Yankess Stadium, June 30th 1998. If my calculations are correct that is YSL #5835 Tino Martinez. That card remains on my want list. Within my binders I also have pages of cards related to the Phungo games. For instance I have a collection of every player who I have seen hit a grand slam. Yes most of these players are pretty common like Darren Daulton or Bobby Abreu and now I will be adding Shane Victorino to the Grand Slam page. The ones that hurt are the those hit by the opposition. Eventually I will have pages dedicated to the 2008 World Series. It will be filled with Phillies but it will also have Rays, like Rocco Baldelli who hit the only Home Run I saw in the 2008 World Series. I find it to be a way of tying together my card collection with the experience of going to the game. And it also brings some personal value to cards that may otherwise be considered commons. For Hall of Fame Thursday we have another post from the Philadelphia Sports Hall of Fame, It must be A's week here at Phungo as today we salute the 1929 Philadelphia Athletics. The 1929 A's won 104 games and broke a string of three consecutive pennants won by the New York Yankees. The A's bested the Cubs 4-1 in the World Series. Hall of Famers Lefty Grove, Mickey Cochrane, Jimmy Foxx, and Al Simmons were all members of the 1929 Athletics who were led by Hall of Fame manager Connie Mack. Phillies fans may be familiar with Jack Quinn's name. He is the pitcher mentioned by commentators when discussing Jamie Moyer as the second oldest pitcher to appear in Post Season and World Series games. During the '29 series Jimmy Foxx became the first player to homer in his first two World Series games. In game 4 the A's overcame an 8 run deficit to win the game with a 10 run 7th. This remains the largest comeback in playoff history. The A's would go on to win the 1930 World Series and the '31 AL Pennant, but after that Connie Mack would break up the team. Afterwards the A's would struggle until their rebirth in Oakland during the early 1970s. As mentioned earlier this week the Philadelphia Athletics Historical Society is located outside Philadelphia and their site has a lot of interesting items about the Athletics and Baseball history. Complements of Fielder's Choice - Donruss Threads and SP Authentic including PUDGE!! The bounty from the World Series wager with Fielder’s Choice has just come in. Dave sent me a couple of packs from two pretty nice products, Donruss Threads and SP Authentic. I had not seen any of these cards other than via web postings by various card bloggers. Dave sent 3 hobby packs of each, which was enough to give me a good sample of both products. Both have a similar price point – Donruss Threads is a new product and did have a fresh quality to them. While the SP authentic felt like a lot of other 08 UD releases – All the UD card backs look similar regardless of what line their from. Donruss Threads also came through with a pretty sweet Game Used card! And a healthy mix of of prospects and former players. The prospects were about evenly split between high and low level prospects. The three packs yielded top prospect Vitters from the Cubs, the Braves Jordan Schafer, the Brewers Mat Gamel, and Boston's Lars Anderson. I believe the Chavez card above is a gold variation. Donruss has been away for a while though and has some issues, can you spot an error on this card? SP authentic presented a nice selection of current stars. Among them were a former Phillie that hit a lot of Homers and also a new Phillie who only has one homer but it was very memorable. The Player photo is set off by being slightly raised slightly and somewhat shiny. The cards also features the players uniform number in the lower right hand corner in white. It isn't very visible because it is on a white background, but it is an interesting affect. On the right the number overlaps Blanton's left leg. Each SP pack came with an insert. The last card in the 3rd pack of SP Authentic I opened was the J-Roll card. Similarly the last card in the final pack of Donruss I opened was a Phillie. Pretty cool – and I think it brings us full circle on Dave’s guest post from last week. Team Phungo would like to Thank Fielder's Choice and look forward to the Phils facing the Rays in a future World Series. The first Spot The Sig! auto was penned by Huston Street formerly of the Oakland A's and now the newest member of the Colorado Rockies. The first person to identify the Auto was Mark of Stats on the Back, who may have the best banner in the Card Blogoshpher. Joe over at Cardboard Addiction correctly figured out that I have never seen Huston Street pitch. Apparently this card was a little easier to figure out than I thought as it took Mark all of 13 minutes to ID the auto. Mark gets a double and Joe gets a walk. Star Signings are part of the 2007 Upper Deck Series 1 and Series 2. Huston Street is one of 63 subjects in Series 1. The most desirable auto in the set is likely the short printed Albert Pujols card. I picked up this card off of ebay, most likely while I was looking for something else, but thought it was a pretty good deal. I have an ongoing project to collect autos representing every major league team. I may have targeted this card for that reason. Since Street was the closers for the A's who don't get a ton of national recognition his autos tend to come pretty cheap. According to my records the card went for $3.41 incl shipping. I try and see as many different teams play as possible, with the intention of seeing every major player of the era at least once. But catching the AL West teams in Philadelphia is pretty tough. The A's have only visited Philadelphia once that I remember. When the A's came to Philadelphia it was a big deal because not only was it an inter-league match up but it meant the return of the A's to the city where they originated as the Philadelphia Athletics. There are still some A's fans in the area, because of the teams former affiliation with the city. There is even a Philadelphia A's Museum located in a city suburb. At some point I plan making time to visit the museum, but have not yet. Stats on the Back - Representin those stinkin Mets no doubt - Has a man on 2nd. Cardboard Addiction - posting for 'The Nation' - Has a man on first. Everybody else is On Deck. For further information regarding the Phungo Spot the Sig! contest click here and join the party - you just may find yourself with a stack of cards come spring training! As I have been alluding to in a few posts lately Team Phungo is hosting it's first contest! The contest will revolve around identifying unknown autographs. I ran one auto last week as a test run, and it was quickly IDd by Dayf. While picking out select autos for this feature it became clear that some autos were significantly harder to read and figure out then others. Knowing this, I have decided that certain autos will have different values. I also decided that the competition should be scored in some sort of baseball fashion. To satisfy both of these requirements, I picked base hits as a measure of a signatures difficulty. 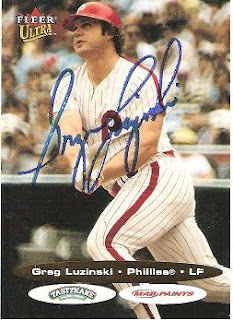 Last weeks Luzinski card would have been a single. While harder cards to ID would be doubles, triples and homers. I plan on running out 15 cards - hopefully each Sunday or Monday until Mid-February. Whoever has the most runs at the end of the contest Wins. Aside from being named Spot the Sig! Champion, I will send off a batch of cards to our winner. Respond in the comments to THIS post. Only the first correct response will be awared the weeks Hit. Each week I will try and come up with a bonus question related to the Auto. The bonus will be good for minimal value - I think a Stolen Base or Walk and this will also give a chance for two winners each week. I have been to over two hundred ball games - How many times have I witnessed the player from this weeks contest in a Major League Game? Oh and one last thing. This weeks card is good for a Double. Good Luck. For Pro Football Sunday Phungo would like to recognize Harold Carmichael and Al Wistert. Both football players were recently honored with induction into the Philadelphia Sports Hall of Fame as members of the 2008 class. Harold Carmichael played for the Philadelphia Eagles from 1971-1983, during his career he caught 590 passes, 79 for touchdowns. He was likely the greatest receiver in Eagles history, he played for the Eagles 1980 Super Bowl team and was also elected to four Pro Bowls. Carmichael is also a member of the NFL 1970s all-decade team. The 6' 8" receiver was a tall target for Ron Jaworski and other Philadelphia QBs. He was also durable and played in 162 consecutive games from 1973-1982. At one point Carmichael caught at least one pass in 127 consecutive games, which was the NFL record until 1986. Carmichael remains in the Eagles organization as the Director of Player Programs. His duties include assisting rookies and new players with acclimating themselves to Philadelphia NFL. He also helps with coordinating Alumni activities. Al Wistert played his entire career (1943-1951) with the Eagles as a two-way lineman. He was a member of both the 1948 and 1949 NFL Championship teams. Wistert also earned All-Pro honors eight times and served as the Eagles captain from 1946 through 1950. Wistert is still living at the age of 87 and was able to make it to the Philly Sports Hall induction ceremony. He was able to visit the Eagles practice while in Philadelphia. I would also take this time to mention that the NFL Alumni Association recently has won a lawsuit that may allow them to have better pensions and medical benefits. The ruling will likely be appealed, but at least temporarily the players of yesterday, who the NFL was built upon, may be able to reap some of the benefits of the cash cow that the NFL has become today. Hello to all the readers of Phungo! This is Dave from Fielder's Choice Baseball Card Blog. I'm writing on Phungo today as a result of a bet that I made on the outcome of the World Series. Phungo will also be receiving some hobby packs from me. I want to start by congratulating the Phillies for winning the World Series. Like I said on my blog, they are incredibly deserving champions. Not only are they a relatively likable team with an extremely passionate (to put it mildly) fan base, but they have had to endure more losing than any other team in baseball history. As a Rays fan, I know how frustrating it can be to support a team that doesn't win, so I have a lot of respect for Phillies fans. Despite being around since 1883, they didn't win their first World Series until 1980. They had developed a winning team in the 1970s that was built around a superstar, Michael Jack Schmidt. The terms of our bet would be that the loser would write a post on the winner's blog about a player or a card from the other team. When I think about the Phillies, the first person who jumps into my mind is Mike Schmidt. He's not only the best Phillie of all-time, but he really deserves to be considered one of the best players in baseball history. At the very least, he is undoubtedly the greatest third baseman who ever lived. Schmidt amassed 548 home runs in his career. After the recent steroid era, it seems like there's a new member of the 500 home run club every other week, but consider that there are only two other players from Schmidt's era who hit 500 home runs - Reggie Jackson and Eddie Murray. No other third baseman in history hit more home runs or had more RBI than Schmidt (and no, A-Rod doesn't count since he was a shortstop for most of his career). His 10 Gold Gloves are proof that he could dominate all facets of the game. He also was a 12-time All Star, 3-time N.L. MVP, and most importantly, MVP of the 1980 World Series. Guest Author - Fielder's Choice! Phungo would like to introduce Guest Author Dave from Fielder's Choice. As I am sure you know Dave is a big Rays fans and I am a Phillies fan - We decided to bet on the World Series with the stakes being a few hobby packs plus a guest column on the winners blog. Well today, I get the day off while Dave will post here regarding a Phillies card and player (actually a legend). Phungo is definitely fortunate to have Dave pen a column today and I hope all (both) of my readers enjoy Dave's piece. Dave's Post will appear at 8pm (Eastern). Team Phungo would also like to welcome any readers from Fielder's Choice, please check out the neighborhood. We are pretty Phillies centric, but I like to cover a lot of baseball and other topics as well. I would also like to take time to plug a guess the Autograph contest called "Spot The Sig!" which Phungo will be running during the off-season. First Auto will be up Sunday Night. This weeks Hall of Fame card honors Baseball Hall of Famer Ed Delahanty, upon his induction to the Philadelphia Sports Hall of Fame. The Philadelphia Sports Hall of Fame honors Philadelphia connected Sports Figures. Tonight, November 13th, the Philly Sports HOF recognizes it's fifth Class. The Charter Class included icons such as Richie Ashburn, Dr J, Chuck Bednarik, Bobby Clarke, Joe Frazier and Harry Kalas. This years inductees consist of Delahanty, Harold Carmichael, Mickey Vernon, Maurice Cheeks, Lionel Simmons, Dorothy Porter, Herb Magee, Fred Shero, Al Wistert, Leroy Burrell, writer Stan Hochman and the 1927 Philadelphia Athletics. Team Phungo will feature all the members over the coming weeks. Ed Delahanty was elected into the Baseball HOF in 1945 by the Veteran's commitee. He played for the Philllies from 1891-1901 and for the Philadelphia Quakers prior to that. During his career the Left Fielder amassed 2596 hits, a .346 Batting average, and 455 stolen bases. He finished his career with 101 home runs - at the time the record for all time home runs was only 138, held by Roger Conor. On July 13th 1896 Delahanty became only the second player to homer four times in a game. Delahanty was from a Cleveland Ohio family which put 5 boys into the Major Leagues - Ed, Frank, Jim, Joe, and Tom. They are the largest group of siblings to play ML Baseball. The brothers combined to play 41 seasons and over 3500 games. Ed Delahanty died at the age of 35 under sketchy circumstances in the waters of Niagara Falls. This incident is detailed in the Ed Delahanty Wikipedia entry, which was also the source for much of the information for this post. Congratulations to Dayf for being the first to Spot the Sig. Should have known he would come through. Stay tuned for next weeks Sig - If I get enough support there may be a contest in the works. More on that below. This card connects two eras of my Phillies Phandom. The Phillies gave each fan, who attended the final Veterans Stadium game in 2003, a set of 12 cards commemorating the All-Vet team. The Bull was the All-Vet representetive for the Left Field postion. I suppose it is fitting that Dayf was first to figure out this Auto, since the Braves defeated the Phils that day 5-2. After picking up this card at the last game at the Vet, I also took it down to the first game at Citizens Bank Ballpark where Greg Luzinkski signed it out front of the brand new Bull's Barbecue. Yes, similar to Camden Yards in Baltimore, The new Phils park has a Barbecue area beyond centerfield. In Baltimore they have Boog's Barbecue presided over by "Boog" Powell. The Phils have Bull's Barbecue, with Greg Luzinski at the helm. The Bull has become an ambassador for the Phillies, appearing in the area and on TV and radio a good bit. And of course he also puts in time at Bull's Barbecue which is located on Citizens Bank Ballpark's Ashburn Alley. I find Barbecue a bit messy for my taste on most game days but have enjoyed a few sandwhiches there over the years. Anyone on the late 70s and 1980 World Championship Phillies teams are among the first players I can remember. Of course Luzinski is among the most memorable of this group - Big dude lots of pop and of course that Polish last name. One of my favorite moments of the Phils run in 1980 is during one of the post season games Luzinski had been removed for pinch runner Lonnie Smith who stayed in the field. Howard Cosell was the color analyst for the game and had apparenly forgotten about the replacement. When Smith eventually came to bat in Luzinkski's spot in the order, Cosell said "And now the question is 'Can the Bull do it again?'". I will post a card here eventually but in case you don't know, Lonnie Smith don't look much like the Bull. I am sure Cosell was only looking off his scorecard but it was a moment that still remains funny to me today. And since this Card commemorates Veterans Stadium, I also find it appropriate to post here during the week of Veterans day. I plan on running Spot the Sig weekly throughout the Baseball off-season. As of now I would like to get the next STS up on Sunday night. I am thinking of having a contest that will run the duration of the feature. Probably will award a stack of cards to whomever spots the most Autos during the contest. NEW Phungo Game Show - Spot The Sig! Ok last week we introduced Hall of Fame Thursday, this week we are introducing another off-season weekly feature. Spot The Sig! This is a simple game - each week, between now and lets say mid-February, I will present an autographed item, and open it up to readers to guess the author of the autograph. For openers I picked a pretty easy one I think. Yep easy one right, on a scale of 1-10 where 1 is easyeasyeasy and 10 is hard like batting righty versus Brad Lidge, I am writing this one down as a 1 possibly a 2. This week the signature is a on a baseball card - this won't be the case every week. Some weeks Spot The Sig (STS) will feature cards from other sports, or possibly on other items like balls and tickets. Some of the autos may not even be sports related. Since I believe this is an easy auto, I will challenge you with this bonus question. What set is this card from and what is the card number? At the time Veterans Stadium was built there was a controversy over the naming of the stadium. This was during the era of the Viet Nam war and ultimately Philadelphia city council chose the name Veterans Stadium to honor of the Veterans of all wars. In 2008, the country is once again at war and on this day America honors it's Veterans. Veterans Stadium was the Home to the Philadelphia Phillies from 1971 through 2003. The Vet was demolished in the spring of 2004. The photo below is of a Marker placed where Home Plate was once located in Veterans Stadium. That's the World Series Trophy prior to game 5 part 1. Former Dodger and current Fox broadcaster Eric Karros is seated with the trophy. This photo was taken prior to the game. FOX had a tent set up down the 1b line which they were broadcasting from. To celebrate the Phillies World Series victory I hit the card show at the Concorde Mall outside of Wilmington Delaware last weekend. I perused several dime boxes, here are some of the Highlights. I picked up bunches of Phillies and some cards of Hall Of Fames like Robin Yount. The Jenkins card was a particular surprise as it was out of the recently released Updates and Highlights. I also got some some good looking star inserts of players like Vlad, and Griffey. The Griffey Foil doesn't look good on the scan but is a sharp card. I really like the Gallery Heritage cards and will keep my eyes open for more of these. I picked up a half dozen cards from last years Wal-Mart Trading Card History. This is a set I keep looking for on ebay and was happy to find a couple at the show. As usual I picked up some Heritage cards of various Stars like Bernie Williams from several different sets Bowman, Topps and UD Vintage. 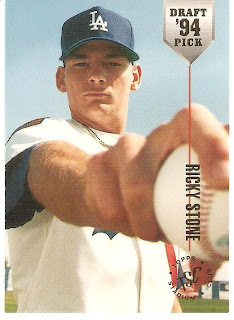 The best for me was finding thirty 08 Topps inserts in a dime bin including 20+ All-Star Rookie Inserts like the Strawman. I also picked up a couple of Fleer Flair from different years - Always a favorite of mine. Obviously I was pleased with all my nickel and dime box finds. Filling out the 08 inserts was pretty awesome. I have also been working on the 1959 Topps base set and was able to find 5 commons pretty cheap. There were maybe 20 or 25 tables with a wide array of items. The dealers had apparently had a good weekend, business likely bumped by the recent Phillies triumph, and certainly did not complain as much as they do at a typical show. $25 for a fun day at the card show, very worthwhile! I have been hesitant to start a weekly feature as I don't want to put myself on a schedule, but I thought featuring a Hall of Famer each week would be a good way of anchoring Phungo during the void of the baseball off-season. Yes, I do follow other sports (Flyers Hockey, College Hoop, PSU and Minnesota Vikings Football) but Baseball is my primary love. The goal each Thursday or Friday will be to come up with a HOF player who is interesting and maybe even timely. The HOFs will not be restricted to baseball but will likely be baseball centric – although they in fact may not be in any Hall of Fame - well other than my own. Former Phil and current Phils broadcaster Larry Andersen is in my personal Hall of Fame, just because I think he is a helluva funny guy - my blog my rules – Autocracy rocks!! 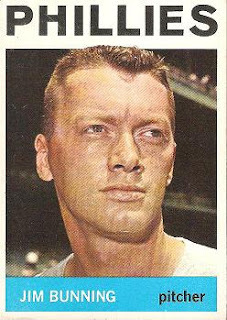 But for week one the Hall of Famer, as mentioned above, is Jim Bunning. Yes a Baseball player and an actual member of the Baseball Hall of Fame. This is a good week to recognize Bunning, who threw out the ceremonial first pitch in game 5 of the 2008 World Series. Bunning is also a US Senator and this is an election week, although I will note that I can't say that I agree with many of Jim Bunning's conservative views. The man does have one of the more varied Wikipedia pages you will find. Bunning had two stints with the Phils, playing with them for 6 years between 1964 and 1971. He had 224 career wins including a perfect game on Father's Day of 1964 and was an all-star in 7 different seasons. Bunning’s number 14 is retired, which is fortunate, because it helps the Phillies avoid the awkward question of retiring Pete Rose’s #14. The National Baseball Hall of Fame will host an exhibit dedicated to the 2008 World Series. Items will be featured that were used or worn by Cole Hamels, Ryan Howard, Carlos Ruiz, Jayson Werth, Joe Blanton, BJ Upton, Joe Maddon, Carl Crawford and others. The Exhibit starts Mid-November and runs through the 2008 Post-Season. Maybe they will include the pants that Cole Hamels wore as he walked out to the bullpen to warm up for game 5. Or perhaps they will include the spikes that B J Upton is wearing as he takes warm up swings in the photo below which was taken prior to game 5 part 1. I am slowly sifting through pictures from last week - most are pretty blurry like those above, but I should still find some worth posting. It is election day so get out and vote. It is your right and your opinion deserved to be recognized. If you click on either photo they enlarge so you can get a clearer look at the items. Cole Hamels deservedly won the World Series MVP award. He won game one and was in line to win deciding game 5 before Rocco Baldelli homered off of Ryan Madson. Hamels was 4-0 over the post season which tied the record for wins. This is the 2008 Heritage All Star version of Hamels card. 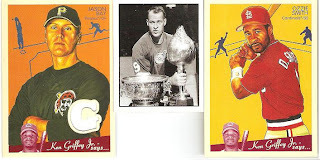 I like these cards - they closely mirror the original All-Star cards of 1959. The motif follows on the reverse side with the card number in a shield, a cartoon, and a short point of interest about the player. When Topps released the 1959 set the All-Star cards were present in the final High Number Series and are somewhat harder to find then cards from the earlier series. In the Heritage edition the cards are part of the regular release, despite the fact that Topps is planning on releasing more 08 Heritage cards in another product. At one time the World Series MVP received the Babe Ruth award. The award was the subject of a Topps card in 1972. The Babe Ruth Awared is no longer presented, the last award winner was David Eckstein in 2002, when the Angels defeated the the Giants.